Kiefer Ravena shoots over his defender in Chooks-to-Go Pilipinas’ opening game in the FIBA Asia Champions Cup in China yesterday. 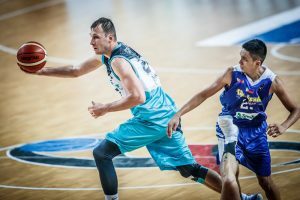 CHENZHOU (FIBA Asia Champions Cup 2017) – Chooks-To-Go Philippines opened their FIBA Asia Champions Cup 2017 campaign with a come-from-behind win over BC Astana. The Filipinos trailed at the half, 43-35, but wonder guard Kiefer Ravena took over in the second half, leading Chooks-To-Go in their third quarter fightback as they outscorted BC Astana, 22-12, to retake the lead for good. 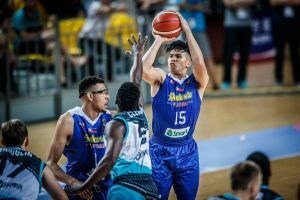 Ravena impressed in his debut at the senior level of FIBA Asia, scoring 22 points to go along with 3 rebounds, 2 assists, 2 steals and 2 three-pointers. Naturalized player candidate Isaiah Austin also had an auspicious first game for the Philippines tallying 17 points, 18 rebounds and 6 blocked shots. The Kazakhs started the game with hot outside shooting, making 8 triples in the first half, but their offense cooled significantly in the third period. Boholano Francis Tamsi, who was a last-minute addition to the PH squad, played for 16 minutes in his team’s opening game during the FIBA Asia Champions Cup. Dmitriy Gavrilov paced them with 11 points and 11 rebounds. Things will not get easier for the Kazakhs on Day 2 as BC Astana take on Petrochimi Iran, while Chooks-To-Go face Sareyyet Ramallah.